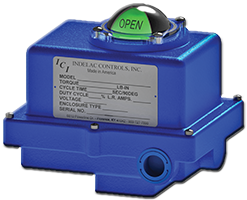 Quarter Turn Electric Actuators | Indelac Controls, Inc.
Quarter-turn electric actuators use electrical energy to open, close, or throttle valves that require highly accurate positioning. They are designed to automate the precise operation of valves that open and close through a rotary 90° motion (a quarter turn), such as ball valves, plug valves, choke valves, dump valves, and butterfly valves. Rotary quarter-turn actuators can also be used to automate dampers to regulate the flow of air in chimneys and air-handling equipment for the HVAC industry. 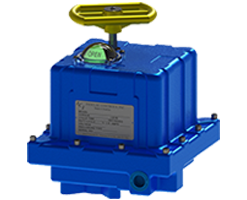 These actuators can be equipped with either an AC or DC voltage electric motor capable of delivering a wide range of torques for automated and responsive valve positioning without the complexity and cost of a pneumatic supply. Their compact design and relatively light weight are ideal for situations where installation space is limited, enabling additional clearance for alternative piping options. 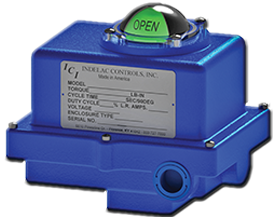 Quarter-turn electric actuators from Indelac Controls Inc. (ICI) are designed and constructed from carefully selected materials to suit various operating conditions. All internal mechanical and electrical components are housed in NEMA 4 enclosures for adequate protection against incidental contact with water and dirt. 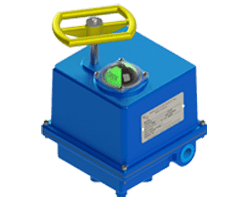 Our actuators are also available in NEMA 4X-compliant and NEMA 7-compliant enclosures for safe and efficient operation in highly corrosive, ignitable, or explosive environments. 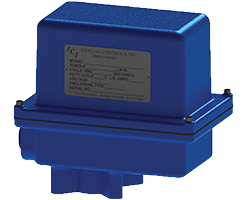 Our diverse line of quarter-turn electric actuators can meet a variety of situations. 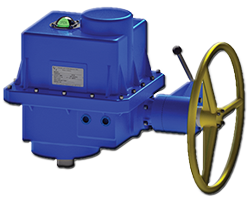 For example, the R Series and RXP Series electric actuators rotate from 0° to 90° in 2.5 seconds. Models also deliver torque from 100 to 27,300 inch pounds to meet any specific application demands, whether your requirements are simple or heavy duty. 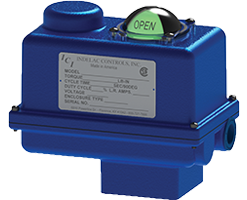 Quarter-turn electric actuators from ICI are available in both AC and DC voltages, and feature 10 available power options, including 12Vdc, 24Vdc, standard 115Vac, and 230Vac. For enhanced corrosion protection in aggressive environments, we also offer optional coatings such as anodic films, epoxy coatings, electroless nickel plating, and chromium conversion coatings for additional passivation and barrier protection. 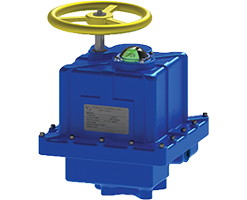 Most of ICI’s quarter-turn actuators are designed to comply with ISO 5211:2017: Standard for Industrial Valves - Part-turn Actuator Attachments guidelines. 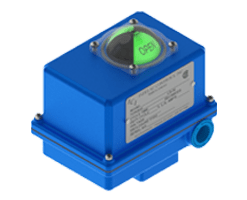 Our direct-mounted actuators are among the most versatile on the market and have the added benefit of saving our clients space as well as cost. 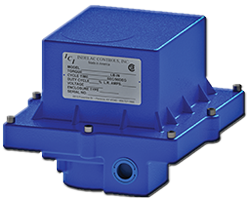 ICI’s quarter-turn electric actuators are used in a wide range of industries and applications. To learn more about our quarter-turn electric actuators and how they can be used to enhance control in your operation, please contact our technical team or request a quote.